Hello my dear readers! I have some more reviews for you today! As you may remember, I did a Caudalie Brand Intro post a few weeks ago. If you haven't had a chance already, please check that out for the Caudalie Brand Introduction and the review of the Caudalie Vinexpert Body Butter! As a wine lover (and the wife of a wine and beverage distributor), I was excited to try out some products from this line! I mean, an entire skincare line designed around the love of "all things grape", I love it! I actually tested these products a few weeks ago (when the weather was very cold), but saved my notes for writing this review! 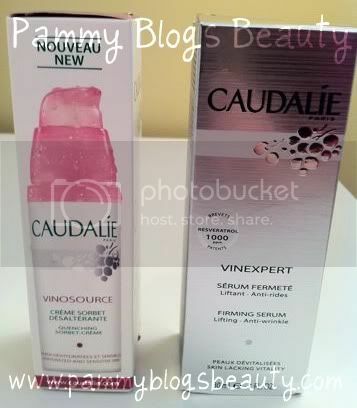 This review will cover the Caudalie Vinosource Quenching Sorbet-Creme and the Caudalie Vinexpert Firming Serum. For the reviews and more photos, please keep reading after the jump! Grape Water: Rich in minerals, vitamins, and polysaccharides: It can "increase hydration by 127%" and can cause a "62% reduction in sensitivity and discomfort"). Vinolevure: Vinolevure is an ingredient extracted from wine yeast. It can "protect the skin's natural defenses" and can hold up to "100 times its weight in water". Grape Seed Polyphenols: These are powerful antioxidants taht block "100% of free radicals and are 10,000 times more effective than Vitamin E. They Stimulate microcirculation and help skin to maintain its hyaluronic acid content". So, how did I like this product? This is a very lightweight, yet also somehow very hydrating! 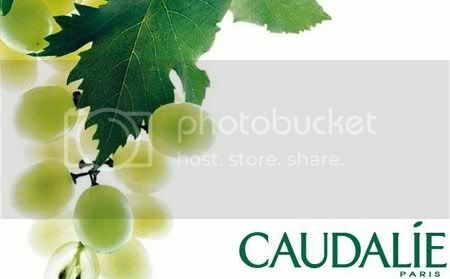 Contains the signature Caudalie "white grape" scent (see below). Feel: This is a white medium consistency cream (somewhere between a lotion and a cream) that is non-greasy. It absorbs quickly and feels light as air on your skin. It leaves skin soft with a nice sheen, but no greasy residue. I find that my skin is very well prepped for makeup after using this cream. Packaging: I love the packaging of this product! Not only it is an attractive bottle with its white base and pink pump, but it is also very functionally designed! What can I say, I *heart* pump dispensers! This bottle is totally air tight (this keeps the product fresh!) and the pump dispenses just the right amount of product. I found that the pump works well and you can really control the amount that gets dispensed. 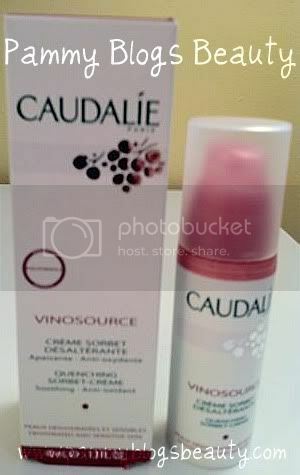 Scent: Like the other Caudalie products that I have tried, this also has the unique Caudalie "white grape juice"-like scent. Now, ya'll may know that I am generally not a fan of the addition of scent for facial skincare products. My skin is so sensitive; and, I have found that scent can sometimes be an irritant (especially in a product designed for the face). The scent is pretty and refreshing, but it is a bit heavy (and I would actually like this product better if it had no scent). I occasionally experienced a little bit of redness while testing this product (it could *possibly* be from the scent?). Note: I did experience a slight tingle upon application that would dissipate quickly. This irritation was very mild and not enough to make me stop using this product. Those of you without super sensitive skin or issues related to product fragrances might not experience this tingling or mild irritation. I applied this in the mornings and the evenings right after washing my face (either after serum if using a serum, or right after washing face if not using a serum). This creme kept my dry skin nicely hydrated and relatively flake free (my skin is super dry and prone to flaking). Overall: I loved the packaging of this product and the nice non-greasy feel of this product. It moisturizes without leaving you feel greasy. Also, it provides a nice prep for makeup. But, I wish that they didn't scent this product. But, if scents don't bother or irritate your skin, then you will love this pretty white-grape scent. It is a very "clean" scent. According to the Caudalie Website, this product was designed to "improve the appearance of sagging skin and smooth the look of lines and wrinkles" and it "provides a lifting effect" and "improves the look fo skin's elasticity and firmness". Now, I must start off by saying that I do not have issues (yet, crossing fingers) with any lines, wrinkles, nor sagging skin. But, when my skin is very dehydrated, I do have some fine lines around emerging around the eye area. So, with that said, I really couldn't evaluate this products effectiveness on lines, wrinkles, and sagging skin/loss of elasticity. I primarily use serums because they are good for age-prevention (vitamin and antioxidant benefits), they usually provide a nice base for makeup, and often serums can decrease skin's sensitivity and allow your treatment products to work better and with less irriation. This product retails for approximately $79.00 for 1 oz. Whew, that is steep! 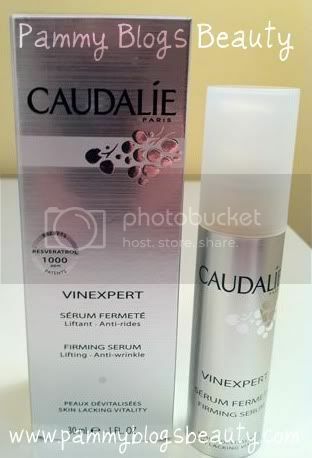 The Vinexpert Firming Serum has the same "white grape" scent as the Vinosource Creme Sorbet. However, I had no tingling with this product. But, if I could re-design this product, I would do so without the scent. It smells pretty, but ya'll know my general stance on scents for facial products. Application: I applied this serum morning and night right after cleansing my face and before moisturizer or sunscreen. The Feel: I *really* liked the feel of this serum going on the skin! It really feels amazing! I experienced absolutely no stinging with this product. Also, while this isn't a moisturizer, I do feel that it is lightly hydrating. Results: I feel that consistent use of this product make my skin look smooth and even. I felt that my skin had a bit of a "glow" and "more color" (a healthy and radiant look). I started noticing this about 2 weeks into the product testing. So, thats it! I hope you all enjoyed reading this Caudalie Skincare review! I find the line's use of the entire grape plant to be unique and inventive! I look forward to exploring more of the Caudalie Skincare range! Hi Pammy, great review (as always)! First how jealous am I that your husband is a wine distributor :) Who doesn't love wine? I see a few ingredients there that could be irritants, at least for me. Including the witch hazel, orange flower, rose...I know I have issues with witch hazel in products causing me some redness & irritation so that could be potentially affecting you as well. Hey Tracy!!! Thanks so much (big smile!). Yes, I must admit to loving that my Hub is in the wine business!!! :) I do think it makes me favor this brand as we have a lot of grape-related discussions in our house! ;) Thank for your tips on the potential irriatants. It is such a guessing game sometimes with sensitive skin. I think my biggest culprit for sensitivity issues in my own skin stems from products containing chemical sunscreens. XOXO!! !